"I know you and Cathy used to be fond of each other, but....you ain't got no hard feelings against either one of us now, have you?" Once Elvis hit the music scene, it was probably inevitable that he would give motion pictures a shot. While many of the later Elvis vehicles eventually became exercises in self-parody, they didn't start that way. 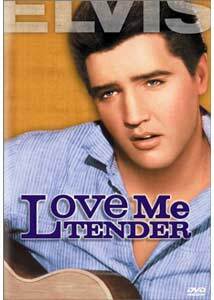 20th Century Fox commemorates the 25th anniversary of the King's "alleged" death with the DVD release of his first film, Love Me Tender. Unlike most Elvis vehicles, he's not the center of attention here; indeed, he doesn't even make his first appearance until nearly a quarter of the way into the picture. He does a surprisingly effective job as the Vance-worshipping Clint, who gradually becomes disillusioned and then violently, murderously angry. Properly handled, it seems he probably could have had a respectable film career much in the Frank Sinatra vein. He does have the four obligatory songs (Let Me, We're Gonna Move, Poor Boy and the title tune). It hardly seems likely that a boy in the early Reconstruction would be singing country-tinged R&B and dancing with the patented Elvis hip swivel, but that's all stuck in here too, bringing the flow to a grinding halt more than once. The story, once you get past the songs, is quite effective as well. The dual moral and ethical dilemmas of the brother's wife and what to do with the stolen payroll give this picture a depth not often found in your run-of-the-mill 1950s drama. Richard Egan is a bit stiff but generally appealing. Debra Paget is of course far too glamourous for a Reconstruction woman facing severe hardship, but she gives the role a good try. Probably best in the cast is Mildred Dunwood as Martha Reno, the long-suffering and loving mother of this troublesome clan. She emotes brilliantly with hardly a line of dialogue, torn by her love for her sons and pained by circumstances that tear them apart, in a manner that would do a silent actress proud. It's a little odd to see a black & white Cinemascope picture, but the widescreen is used well. The scenery is attractive though the continuity and geography aren't always quite self-evident. Director Robert D. Webb milks the situation for all it's worth, generating suspense and drama from both of the central issues. Although there are occasional soap-opera moments, it's nonetheless given a forthright treatment overall. As serious Elvis movies go, this is about as good as it gets. Image Transfer Review: The Cinemascope picture is presented in anamorphic widescreen, and it looks terrific. The black & white picture has deep, rich blacks and a marvelous range of greys. Film grain is visible but the use of an RSDL disc allows for an extremely high bit rate that allows it to spring forth in all its monochrome glory. There are some occasional speckles, and a few brief moments where ringing is visible, but the transfer looks gorgeous overall. Well done! Audio Transfer Review: Both stereo and mono English tracks are provided, as well as a noisy and muffled Spanish mono. The stereo has a nice depth and presence, though directionality isn't terribly pronounced. Dialogue is always crystal clear, and the track is completely free from hiss or noise. The score (variants on the title song and Oh! Susanna) sounds fine for its age. There's nothing for low bass, but it's a nice modern rendition of an old soundtrack without being flashy or drawing attention to itself. Extras Review: There's not much here for extras. A pair of theatrical trailers, one in English and one in Spanish, are included. Two other Elvis pictures for Fox are here as well, and all four are presented in anamorphic widescreen. Chaptering is adequate. The layer change is at a fade to black and quite unobtrusive. A dandy transfer is provided for Elvis' first movie, a well done and affecting post-Civil War drama. Not much for extras, but worth owning.